The holidays are rapidly approaching and you may be thinking about your holiday light decor. 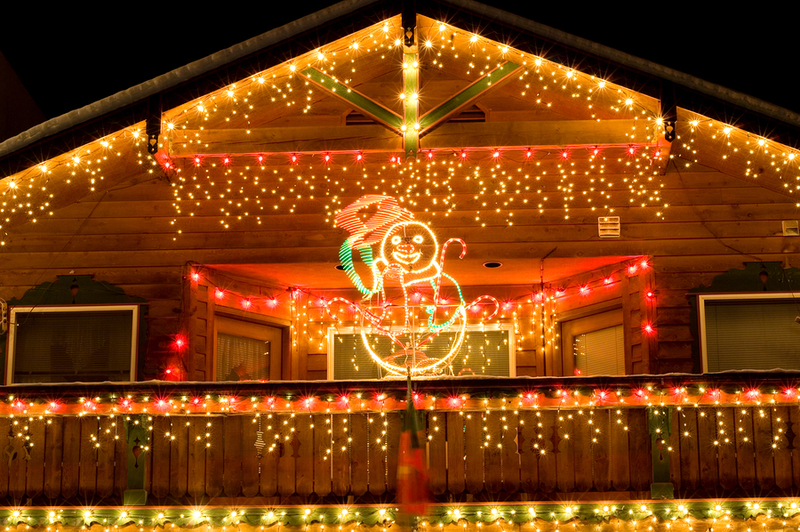 Installing holiday lights and decorations to light up your home for all to enjoy is becoming more popular than ever. Whole neighborhoods are lighting up with outdoor lights, from yard displays, to festooned trees, to lights all over the house exterior. Hanging those lights and decorations correctly is important for safety and to make sure the decorations hold up through any sort of winter weather or other holiday outdoor activities, like kids playing in the yard or snow shoveling. Prestige Roofing is happy to bring you some tips about holiday lights on your roof, so you don’t end up with a repair bill right before the holidays. friend or neighbor – to assist you. They can manage your tools and hand you supplies and decorations. They can help you use the ladder safely by holding it in place. And, of course, if you do pull a “Griswald”, they are there to call for emergency help. When mounting your ladder, you want to make sure it’s on level ground, securely in place. Have your helper spot you while you’re on the latter by holding the ladder to steady it. Unless you are decorating the chimney or the ridge at the top of your roof, you should not need to walk on your roof, which can be very dangerous and needs some knowledge as well as safety equipment. Great displays are ones people see from the street level, so it’s not really necessary to go above the eave line to have a beautifully decorated roof. Any advice we give you here is just our opinion, of course, and we can’t take responsibility for your safety. If you do have to step on any portion of the roof surface, or even just in general for working from a ladder, where sturdy gym shoes that have a good grip and are easy on the roof surface. 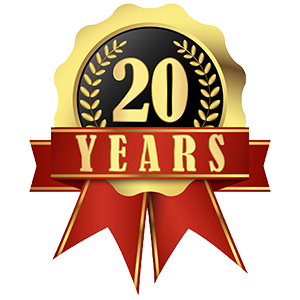 Our best advice, though, is, if you’re not used to working on a roof or ladder, and don’t have the proper safety equipment, hire an experienced, insured professional to install your roof decorations for you. You will get to supervise from the ground and focus on getting the design effect you’re looking for. Another part of best safety practices with lights is to make sure that your strands are in good working order and that you have enough of them to cover the area you plan to illuminate. Of course, check and make sure they are all rated for outdoor use. 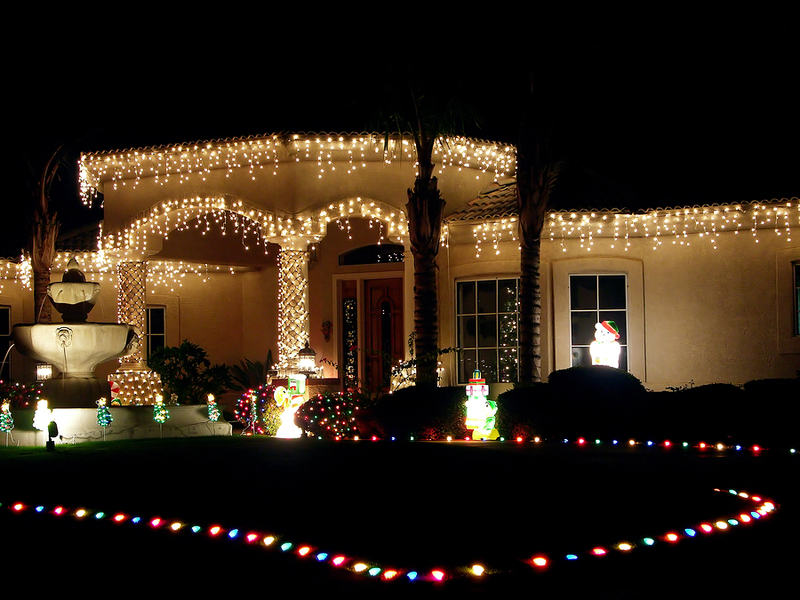 Draw up a plan to scale and add up the footage of holiday lights you have on hand. Lay the strands of lights out in your home a few days before you plan to install them. Look for any frayed wires that could be a fire hazard. Now’s a good time to replace broken or missing strands or bulbs. Promptly get rid of any strands that aren’t up to par, it’s not worth the risk. 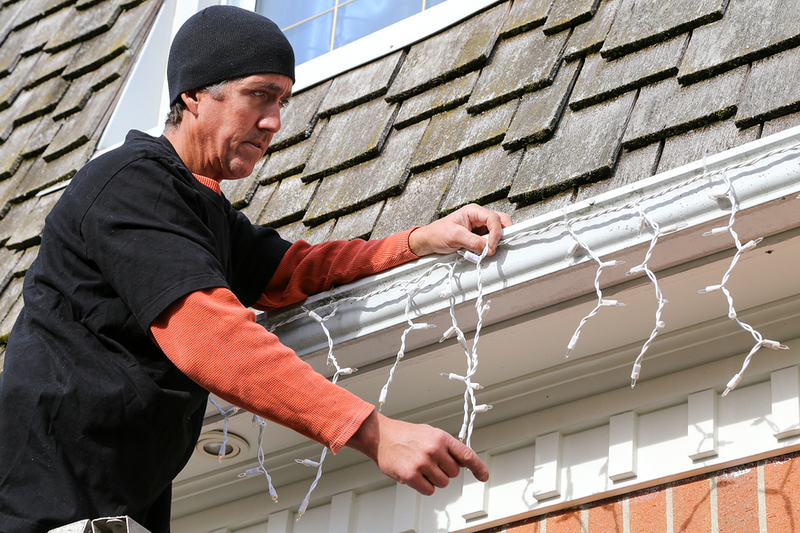 Before installing your lights on the roof, be sure to stock up on plastic clips or hooks on hand for attaching the lights to the eaves or gutters. Unlike nails or metal hooks, plastic is less likely to damage the roof. Make sure you have outdoor extension cords where you need them. You can attach the light strands to shingles, eaves or gutters. Don’t hang anything heavy along with the lights as this can damage your roof components. If you find extremely loose gutters or fixtures, get them repaired before hanging lights on them, as they may further loosen or fall down during harsh winter weather, taking all the decorations with them. Don’t use nails that will put holes in your roof. Structural integrity of the roof is vital because little holes can eventually lead to bigger holes and allow moisture to seep into the roof. Plastic lighting clips are a simple purchase and are very inexpensive. Most hardware stores carry these clips around their lighting and tree displays. You can also use plastic zip ties which will not harm your roof fixtures. If you plan to put heavy displays on the roof (Santa and 8 reindeer?) be sure they are secured with something that doesn’t pierce the roof (such as storm-rated sandbags) so they don’t fall down and damage the roof (or a passerby) in a high wind. Now that the serious stuff is out of the way, it’s time to have a little fun with your lights. 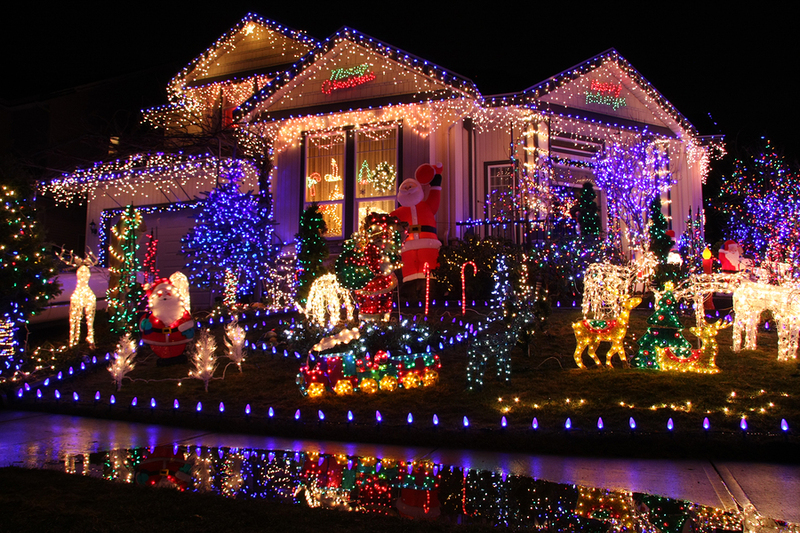 Holiday light displays are more creative than ever, and there are many great ways to show your holiday spirit and even join the neighborhood competition. You can outline your roof with lights, and also add lights to windows, doors, porches, even trees and bushes (just keep far from any power lines). You may want that clean white lights-only look that really gives a pretty sparkle to your home. Or choose varied colors for a fun look, blinking or not blinking. Here are examples of the kinds of lights available as explained by DIY expert Bob Vila. To really make your decorations stand out, you can add music, oversized tree ornaments, or even animated lawn characters. Just don’t get too carried away! Have fun with your holiday decorations and enjoy them for as long as you (and the neighbors) want. Once the holidays are over, make sure you are just as careful taking them down as you were putting them up. Don’t pull or yank on the strands to avoid damage to the components they are attached to. Don’t rush. Remove heavy items slowly and carefully to avoid accidents. 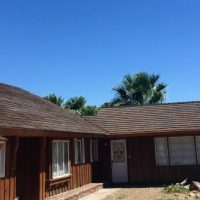 While you’re doing all this, if you do find any roof damage like loose gutters, broken tiles, holes, leaks or other roof problems, give Prestige Roofing a call. Catching roof problems early can save you lots of money down the road and get your roof ready for next year’s (even bigger!) display. 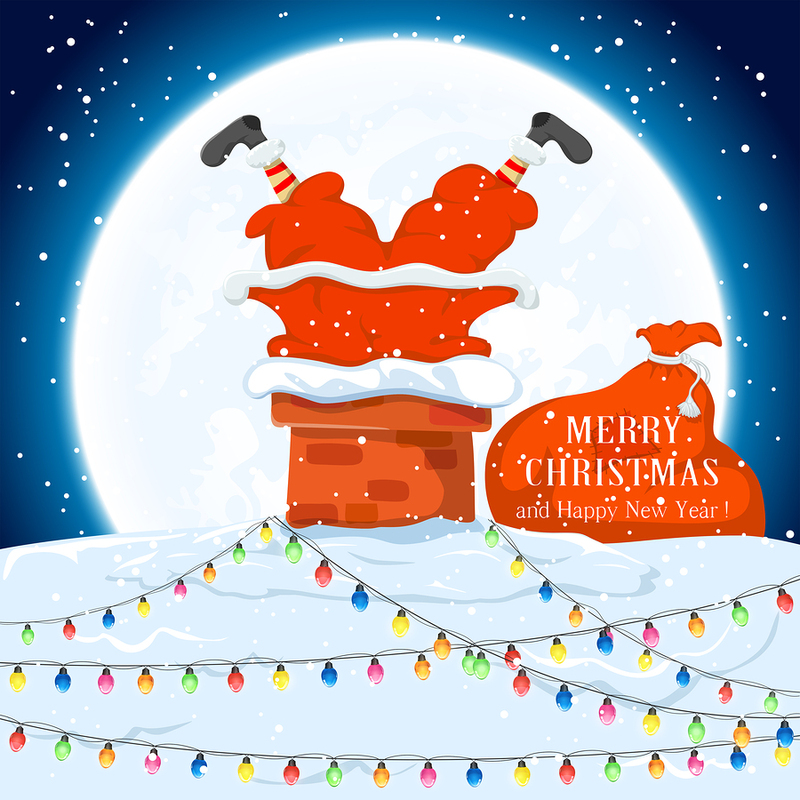 Happy Holidays from the entire Prestige Roofing family.